UDM Downloads > Lexicographic Order Algorithms! Algorithms, software, source code calculate lexicographic order of combinations; compiled program and source code are included. The source code uses two algorithms to find the index or rank for a combination; or find combination for given rank. The first algorithm was discovered by B. P. Buckles and M. Lybanon (1977). 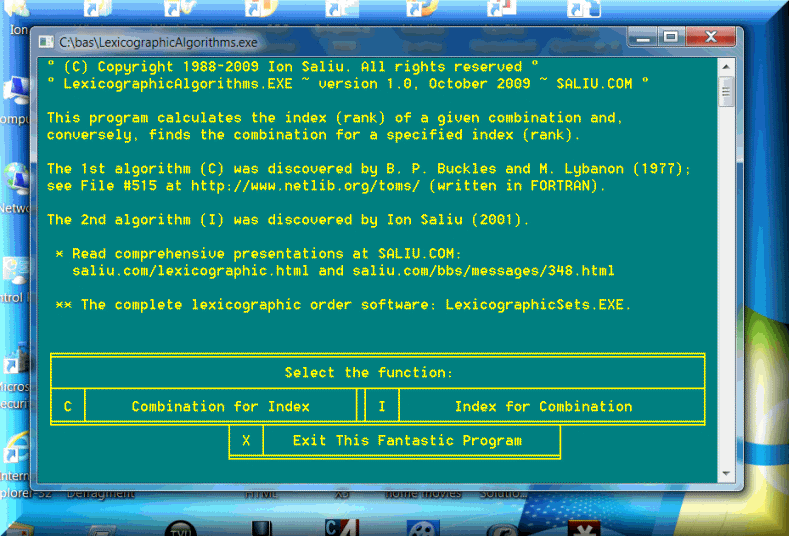 The second algorithm was created by Ion Saliu (2001). The source code is in the Power Basic Console Compiler programming language. Both lexicographical algorithms are very fast; the calculations are almost instantaneous. The algorithms can be expanded to cover even more complex sets, such as Powerball/Euromillions types of lottery games. Writing software to automatically calculate the lexicographical order or rank for a combination - and vice versa - is extremely attractive to a large number of computer programmers and scientists. This is the first successful attempt to write software that does the precise calculations for both situations. This computer programmer expanded his knowledge from the combination sets to all four numerical sets: Exponents, permutations, arrangements (and combinations, of course). Included is also a fast and accurate function to calculate combinations of N numbers taken M at a time (e.g. combinations for a 6-49 lotto game). It works best at the command prompt for best speed; all 32/64 bit versions of Windows supported. http://saliu.com/membership.html http://saliu.com/lexicographic.html . Absolutely the best on lexicographical order, lexicographic, combinatorics, formula, formulas, algorithms, mathematics, software, program, source code, Basic language.